When I posted my latest Deathwing army build the other day, it was met with mixed reviews. Naturally, it's designed for how I want to play and is used against only a handful of people. It wasn't until I came across the post Revising the Dark Angels by Warpstone Pile that talked about his problems with Deathwing where he mentioned the term "social contract" in the comments section of that particular post. It's not something you hear very often, but it's something we all enter into when we go to play a game of 40k. My Deathwing doesn't fit within the usual social contract players make between each other and that can be a problem. So what is this social contract? Good question. For me, it's an unwritten agreement between you and your opponent to play 40k a certain way (usually within the accepted rules provided by GW). I would venture to say that the average social contract between two players means you are going to play your game with a legal army using the rules that GW provides in their core rulebook at a mutually agreed upon point level and you're not going to deviate from those rules (or act like a complete monkey either). It's why we can all go to our local game store and play against anyone else with an army, we're all on the same page. But my army (as it's built now) won't allow me to enter into the standard social contract. It's not a legal army and I'm not playing within the "rules." This is perfectly fine though... I just need to find an opponent willing to agree to play with me using a modified contract so to say. It means I'm not able to just swing by my local store and find someone to play against like anyone else can do. I understand this and that's why I generally play against a few select people or as it's known to us, the Thursday Night Old Timer's League. So what's more important, the standard contract or playing the game the way you want? If you like to play as I would guess 99 percent of players do (well within the rules) then there is no issue as your way of playing matches perfectly with the standard social contract. But what do you do when you don't want to play within the generally accepted rules? I wonder if it takes a certain kind of player. I'm sure it does, but what is it that opens someone up to playing under a modified contract? Is it their approach to the game? How about how long they've been playing? Does it matter how old they are? Does being a parent or having a family make difference? How about how much money they have to put into the hobby? Who knows for sure. I do know that it can be hard to step away from the rules and go your own route. It brings a whole host of additional issues and potential problems to the table that weren't there before. It can be a bit more work (list building) with your army. It means potentially less games with fewer opponents. It can mean having to explain yourself and why you're not using the standard social contract. So why even do it in the first place then? Strange thing is, if you asked me to play against someone with a "modified contract" a year ago, I would have probably said no thanks. But it's a different story these days for me. The game has changed for me over the past year. Is it worth it? I think so. Ron, I think it depends on the person that you are playing. If you just showed up at the gaming club with your Deathwing based on the list and the amount of hobby paint/conversion time you spent with the army I would have no problem playing with modified rules or half codex marines/half Dark Angels. It is clear that you are approaching the game from a fun/hobby perspective. Now, IF you showed up with your marine army that was two land raider, six razorbacks with min guys inside, and three predator tanks, AND wanted to change the rules a bit I would be less inclined to say ok- you are clearly running a tournament type list that is only interested in the "win" with no fluff/story tie in. I would be happy to play your list. In fact I am pretty happy to play most anything as long as you tell me about it first and its not horribly over powered. I have the same problem that you do though in that not many people are ready to return the favour. Heck, there are quite a few people at my local GW who don't like to play Battle missions because its a bit different. And lord knows, its generally the WAAC players who whinge when you have the audacity to play/try something different that doesnt fit into thier neat little world of internet lists. 3. Relying on confusion of what is really what in order to obfuscate things for an advantage. Clearly you're not here to bash heads at tournaments. This list looks like a challenge both to play with and against - and that's what makes it look fun. When you make the trip up to Maryland, I'll be happy to shake your hand across the table. And then, it's on! You do have a point about the social contract keeping everyone on a level playing field. If you walked in and asked for a game from a stranger they would expect a "normal" army list/rules. If it was someone I knew I would have no problem playing their special list for a friendly game. And it isn't like GW is against this either, they will often have battle reports or articles that use modified rules or armies because it is part of the story or campaign. In fact I recently played my Iron Warrior army as a Space Wolf army so I could play with my chosen with daemon blades. My friend had no problem playing my army because I was using the different codex to fit the theme, not to work the system (that and he was playing with space wolf models and using the Blood Angles Codex :-) ). "Social Contract" is a term that gets thrown around a lot in the context of tabletop RPGing. It's the name folks hang on the need for a common understanding between everyone at the table about what sort of game is being played. If everyone playing wants to just kick in the door and kill stuff, that's fine. If everyone wants an intense roleplaying experience, that's just as fine. If some people want one and other people want the other, though... someone's going to be disappointed. It seems that we very much agree that it's just as relevant to mini gaming. (Really, I think it's relevant to damn near any social activity.) There's nothing wrong with extremely competitive play (for all the whining about a "WAAC" mindset), and there's nothing wrong with folks who just want roll some dice and push some toys around... but problems crop up when the two players involved aren't looking to play the same sort of game. That's actually why I really like a RAW-heavy approach to the rules. Sometimes it's not perfect, but no matter where you go... the way those rules are written isn't going to change. The rules, interpreted, very much can and do from region to region. It takes time and trust to modify the contract. I think that's why you've slowly grown more comfortable with doing so. There are a couple of folks around my area I'm comfortable doing that with... but with most, it's just easier to not bother, you know? Fritz: That's understandable. I take the good with the bad. There is no combining to codex units to get the best of each. It's one way or the other for me. I haven't gone as far as just making units or stats up, only swapping out units from differnt books and taking all the good and bad that come with those individual units (to include points changes). Disorderlies: I'll be up your way in August from Gmaes Day barring any natural disaster. We'll have to see about a game then. Rushputin: I think sometimes people confure this "contract" with saying that some kinds of players are wrong or bad for the hobby. I think in some of those cases, they came to the table expecting one thing while the other person came expecting something else. Conflict ensues and someone gets blamed for the "way they play" instead of looking at what we each expect from the game and letting our opponent know that. It's a big hobby, and there is no wrong set of expectations... simply expectations that don't line up with your's. It's so easy for us to assume that people want the same thing out of the hobby we do... when it's probably hardly ever the case. The more I think about this the more convoluted it all becomes. If I were to play against this list... To balance things out; 1)I'd want a matched FOC, allowing me to take 4 Elites and eliminates the two compulsory Troops choices and... 2)All infantry units count as scoring. Oni: So you would want that because it's what I "have" and everything would be fair again if we both can do the same thing? Is your army built the way you imagine it should be and would like to have it or does it leave you wishing for something else? What would you change about your Codex if you could... the exact same things I've done? Is it for balance or fun or both? To be honest, I have trouble seeing how just Troops can count as "scoring" when it only takes paying a few points depending on what Codex you're using and you magically unlock other choices to become troops. Just by taking Sammael, I can get bikes as "troops." What about Blood Angels and jump pack equipped assault "troops." I'm not looking for balance as much as I am looking to play what I imagine my army to be like in my head according to GW background. When my opponent says he wants to use certain daemons over the ones in his Codex because they fit better with how he imagines them being fielded in his list, I have no problem with that. To me, that's different than saying I want what you have. He knows I'm using a Librarian and not Belial. I don't believe it's a game breaker just like him using different daemons is not a game breaker. It can become convoluted if not kept in perspective I suppose. But then again, who's perspective are we supposed to use? More people should play Apocalypse and chill out with the terrible FOC system. Rusty Dice: Apocalypse, Planetstrike, the new Battle MIssions... all things that could potentially give one player an advantage over the other. That's not fair! I think the reason that I would be fine playing against your list is because it somehow makes sense. If you are playing against someone playing Dark Angels Deathwing, you expect terminators to be scoring. I didn't even know until about 3 months ago that you needed Belial to "make" them scoring- I just assumed you declared that you were using Deathwing and from then on you couldn't use any other troops but them. It's not like someone wanted to take something strange like, I don't know, Wraithlords or Carnifexes as troops. They don't have a history of being troops like the Deathwing has with terminators. Having the scouts also there is a little weird, but I guess someone needs to place the teleport homers and whatnot. I'd probably keep them as elites, but with C:SM pricing and options. If Deathwing means scoring terminators, it means scoring terminators. Though of course, if we're throwing the FOC out the window, might as well go whole hog. Plus, you're already playing at a substantial disadvantage with the DA book, so I wouldn't have a problem with it... now if you wanted to take TH/SS as troops without paying something extra, we'd have to have a talk. Both players have to be on the same page, both players have to be mature, and *both* players have to be willing to compromise. Playing a modified list for fluff/fun reasons is different than min/maxing... however, that does not mean you didn't just create a "better" list. With the absence of a BF or pre-submitting your list to an opponent, you are left with pick-up game at your FLG. If you are the trusting sort, and give a good song and dance as to the whys and why nots, Id be willing to take on your list. Im also the type that would not throw a fit if I felt that a massacre in your favor was due to a broken list... I just wouldn't play against any of your non-codex lists. On the flip side, I don't think Oni's request that all infantry units are scoring is out of line. He's just met you, he has never played against your list, and he is taking your word that it is a balanced force. If you blanketly refuse someones request on-the-fly, I would be less likely to play against you. You might be better of approaching the opponent saying you have this idea of a Deathwing variant list. Explain what you have done, and then ask if they would be willing to playtest vs it. This should neutralize all WAAC and animosity for just a friendly "see hoe it turns out" game. Ron, I completely understand where you are coming from. Personally I think it takes a mature veteran gamer to break the conventions of the official rules in a balanced way. This is because they have more of a tendency to do it to represent the background of the army. Luckily for me the 8 guys I usually participate in Garagehammer with are veterans who are open about trying new things. I am pretty easy when it comes to gamers wanting to try out something that breaks the officialdom of the GW rules. I'll play just about anyone's tweaked army twice if it's done for the sake of fluff, just to give it a fair shake. I do think it has everything to do with how they view and amount of time they have playing the game. I think for it to happen, and be fair, it has to be known in advance. I don't think it's fair to, for example, pull out FW rules and say 'oh, btw, I'm using the 'Super-Duper Predator of Much Killiness' or whatever. Your opponent needs ample opportunity to mess with the system themselves. That said, I think that type of gaming is a lot of fun, but again, foreknowledge is crucial. an advantage rather than something more interesting and thematic. to play you and your Deathwing. Sounds like a blast! I don't game GW rules. My group uses other rules and simply uses the miniatures from GW, et al. For the past 20 years, we haven't had much problem. It's your game. Make it as you like. I appreciate all the comment so far guys. The idea behind my list is not to take advantage of any loophole but to create something I really enjoy playing. I'm a firm believer in full disclosure before playing as well. If you have to hide something to win the game, I think you're missing the point of the game on a bigger scale. I can understand if someone doesn't want to play against the force. I'm just glad there are others out there who do. Ron, if you are ever in Brisbane I would seriously like to play against your Deathwing. I think it would be great fun. Also I love Apocalypse, it is a great leveler of the playing field IMHO. While both player get a chance to have UBER units, you can still win games with solid tactics and/or superior numbers. Hell our team is taking two Warlords to a the Apoc doubles tournament we signed on for and we don't actually expect to win, we are going just to have fun (and see some explosions). In this case we will be seriously outnumbered as those entering have had two months already to get rolling and with 6000pts per team (3K each player), with two titans max and only formations from the official books being the only limits, things should be interesting. I know that one of the teams signed on if going mixed tank companies with shield company formations and another is going multi-Green Tide... things are going to be interesting. I think that deciding between the players what should and should be allowed is the best way to play fairly. If everyone involved knows what is going on and has a good time then the game will be a cracker every time. Ron: In my comment above I'm talking about fairness of game play. If I may quote you "Rusty Dice: Apocalypse, Planetstrike, the new Battle MIssions... all things that could potentially give one player an advantage over the other. That's not fair!" It wouldn't be fair for you to have four elites choices, two of which count as scoring and deny me those same advantages. Yes, they are advantages and fluff doesn't grant special privileges. If you want to use a fluffy force that sits outside of the normal game play rules then you need to be prepared to accept a counter offer to the so called 'social contract'. This is what my previous post was about... It was my 'terms' to be agreed upon in the 'social contract' so I would feel as though it was a fair and balanced game. Oni: I'm not so much concerned with complete fairness. In a tournament setting or a pick-up game, sure. There needs to be some sort of level footing. I guess I am willing to give that up in order to play a different kind of game. I'm completely fine with someone else doing the same thing as I am. Would I like to see it kept in line with GW background, sure, but it's not mandatory. I ask for reasonable. If you wanted to take 4 fast attack or heavy support choices because it really fit the fluff for a particular Guard force, that's fine. You want to mix your Guard and Space Marines because fluff shows them working together, ok.
You want to field Daemons with a small contingent of Chaos Marines, ok on that too. Genestealer cult using a mix of rules, fine. I think sometimes we as players struggle with trying to make our armies playable within "the rules" at the cost of not building them the way we really want to. The way we imagine them to be after reading any of the tons of background material out there. most of what can be said, has been said.... all i would say from my own thoughts is, your DW army is very neat and well converted and painted, its strange that you play it with such a cluttered set of rules. i wouldnt like to play against this army as building my army and playing it is part of the hobby, but when playing a game i like to look across the table and try to work out the strategy of my opponent based on his force and the rules attached to it, your force makes that more like hard work than a general game of 40k. Well Ron its an interesting topic, and being a fellow DW player I too have tried to figure ways to make them a "fun" army to play, used FW tank rules so I could run Belial and the Boys in a Godhammer (instead of being forced to take a Crusader), and a Mortis dread, and other LR variants. not even alot just every blue moon. nowadays when I play DW I'm basically playing for a draw immediately. For being super awesome fluff-wise the DW don't actually succeed table-wise in things like capturing objectives or killing vehicles, or even killing anything farther than 2 ft away. Personally, I'm hoping that at the gaming store I've started going to not that long ago, people will be a little bit flexible in the "everything must be equally matched" social contract department. For what it's worth, I want my Chaos Marines to have allies with a force representing the remnants of The Shriven (post- Fortis Binary) as depicted in Dan Abnett's "First and Only" novel. 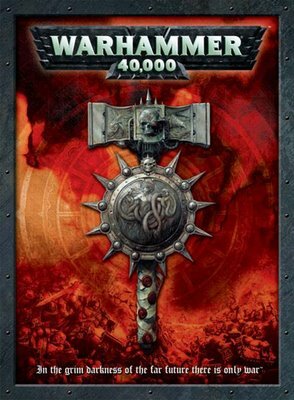 The 3rd Vraks book's Nurgle list is close, but I'd love to be able to field renegade IG stuff from all 3 books AS WELL AS Chaos Marines... but that's not kosher under any current rules (aside from Apocalypse, etc.) Ah well. Hashshashin: I would disagree with playing for the draw all the time. Even when I ran a "legal" list, my wins exceed my losses and I've played against some people who take some tough lists that can do some real damage. They weren't easy victories by any stretch of the imagination, but they were victories nonetheless. Tinweasel: That's what I'm talking about. It's not like you want to make an uber strong, WAAC tournament list... you want to build something out of a book for crying out loud. I'd absolutely love to play against an army like that, especially with all the conversions and such. It'd make for a great game I'm sure. You know, using Forge World rules is the first step. Once you accept using them, it's not long until you begin to just build what you want and make your army how you see fit. Unlike many of the people commenting I dont see his list as overpowered at all. His terminators have combi weapons, like SW but are more expensive. His librarian, if he is using DA rules for him is more expensive than Belial. Everything else is pretty standard.. In fact, by using the majority of DA codex for the army he is putting himself at a disadvantage. @Ron: Commenting on your list here and not in the relevant post. Why are you using Forgeworld rules for the LR and Mortis Pattern Dread? You are already using C:SM for your scouts and the codex will also allow the rifleman dread and LR with MM.